We’re on the cusp of what could be one of the worst snowstorms to strike the U.S. East Coast in recent memory, and in many places it could be the worst on record. The weather models have been remarkably consistent in showing a major snowstorm moving across the country and blowing up off the Mid-Atlantic coast, bringing heavy snow to everywhere from Tennessee to Rhode Island. A large area will see one to two feet of snow from this storm, including some heavily populated cities along Interstate 95 (also known as the I-95 corridor). Here’s what you can expect from what will likely go down in history as the Blizzard of 2016. As of today, Wednesday, January 20, we know with near 100 percent certainty that there will be a nor’easter along the East Coast this weekend and that it will produce a significant amount of snow across a widespread area. We know with increasing confidence that the bullseye for the heaviest snow will be central and western Virginia, likely extending into the Washington D.C. area and possibly areas north and east. We are fairly confident (greater than 50 percent) that the storm will bring heavy snow to the I-95 corridor, including Philadelphia, New York City, and possibly even farther north, toward Boston. We are somewhat confident (around 50 percent) that there will be an ice storm and freezing rain from northern Georgia through eastern North Carolina. However, the cutoff between snow and ice will be sharp, and we don’t know just yet where that line will be. While we know that there’s a potential for extreme snowfall accumulations—in some cities, possibly rivaling the highest snow totals ever recorded from one storm—we still aren’t quite sure about exact accumulations. As I explained earlier this week, snow and ice totals are completely dependent upon the exact track of a nor’easter. Wednesday morning’s run of the GFS (American global) weather model shows the track of the nor’easter taking a more northerly route across the Mid-Atlantic. If the storm stays farther north as it heads toward the ocean, the heaviest snow totals will stay farther north, slamming the I-95 corridor from Washington to New York City. A northerly track like this would bring a major ice storm to North Carolina, with one-quarter to one-half (or more) of an inch of ice possible, in addition to several inches of snow and sleet. On the other hand, Wednesday morning’s run of the European weather model shows a more southerly track, which would put the heaviest snows over almost the entire state of Virginia west of Williamsburg (along the coast), an area that would see one to two feet of snow, with higher totals possible. This outcome would bring a foot of snow far south into North Carolina, burying cities like Greensboro and Raleigh, pushing ice from freezing rain into the southern part of the state, including Greenville, Charlotte, and Fayetteville. The I-95 corridor through Connecticut would also stand to see around a foot of snow—or more in spots—from this outcome. The difference between these two model outcomes—among other models—introduces uncertainty into the forecast regarding exactly who will see how much snow or ice. If you check your local news channel or National Weather Service forecast right now, don't get too attached to the predicted snow and ice totals for your location. They'll likely be different by this time tomorrow. Above is the snowfall forecast issued earlier today by the Weather Prediction Center (WPC), a branch of the U.S. National Weather Service. This product shows their 50th percentile forecast snowfall, which means it’s what they think is most likely going to happen based on the data they had when they produced the forecast. Again, this will change with time, and it’s important to note that this forecast runs through Saturday evening, when the storm will be ongoing. Snowfall totals along I-95 will probably be higher than what the above map shows. The timing of both of these scenarios is about the same. The storm will move slowly, with precipitation starting on Thursday night and Friday morning in the southeast, and with snow spreading over the Mid-Atlantic on Friday. It should start snowing along the I-95 corridor on Friday evening through Saturday morning, and the entire storm will last through early Sunday morning, ending sooner from south to north. There will be a sharp cutoff in snowfall accumulations to the north of the storm, and the cutoff between snow, freezing rain, and regular rain will be sharp on the south end of the storm. This is why the track is so important—that cutoff could mean the difference between a historic snowfall, a destructive ice event, or a wet, dreary day. In addition to heavy snow, strong winds from the low-pressure system itself will create blizzard conditions along and near the coast. 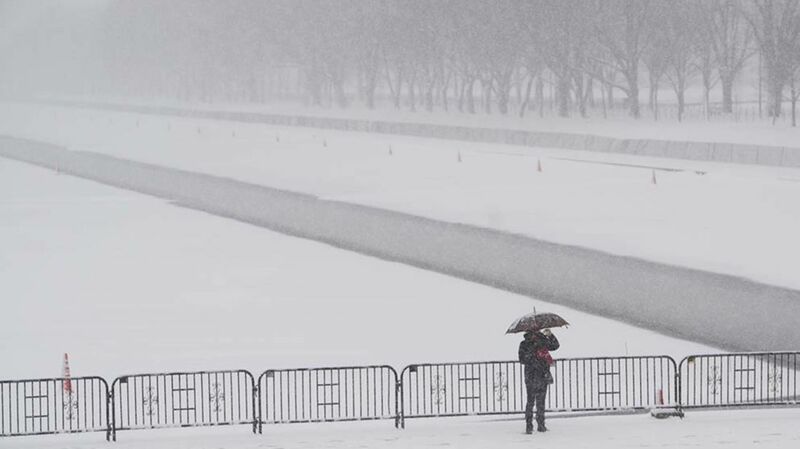 Blizzard conditions are possible in and around Washington D.C., Baltimore, and Philadelphia during the height of the storm. A blizzard occurs when winds 35 mph or stronger create blowing snow that lowers visibility to one-quarter of a mile or less for at least three hours—in other words, whiteout conditions. Strong winds combined with a full moon will also bring major coastal flooding to the Mid-Atlantic states, creating a storm surge several feet above high tide. Vulnerable areas along the coast will easily flood during this storm, and the wind and waves could cause major beach erosion and structural damage. Major power outages are possible due to the combination of heavy snow, strong winds, and ice from freezing rain. Forecasters will get a better idea of what the future holds as we get closer to the storm itself, since the weather models tend to converge on what will actually happen within a day of the event. Until then, though, given the uncertainty in the models, expect snowfall and ice forecasts from your local forecasters to continuously change. You can prepare for the storm by adjusting your travel plans so you’re not out during the worst snow and wind. Give road crews time to clear the roads before venturing out. Make sure you have food, water, and supplies to get through an extended power outage, including blankets, candles, and batteries. Shoveling snow is an intense workout, so pace yourself, and don’t do more than you can handle.